It’s the last day of October, 2017, and that means it’s Halloween, as well as National Caramel Apple Day, and, in Mexico, the beginning of the Day of the Dead, which is really three days. We’ll quickly reprise the events of this day and then onto Halloween. On October 31, 1984, Prime Minister Indira Gandhi (Nehru’s daughter, no relation to the Mahatma) was shot to death by two of her Sikh security guards, leading to riots and the death of about 3,000 Sikhs. Finally, on this day six years ago, the UN certified that the world population of humans reached 7 billion. How they got so exact I’ll never know. Notables born on this day include John Keats (1795), Adolf von Baeyer (1835), Vallbhbha Patel (1875; India’s first Deputy Prime Minister), Dan Rather (1931), John Candy and Jane Pauley (both 1950), and Muzzy Izzet (1974, an English-Turkish soccer player whose name I like). Those who died on October 31 include Kitagawa Utamaro (1806), Egon Schiele (1918, only 28 years old), Harry Houdini (1926; died on Halloween! ), Indira Gandhi (see above), Ring Larder, Jr. (2000), and Chicago writer Studs Terkel (2008). Hili: Strange. They sound as if they were. Hili: Co to są qualia? Hili: Dziwne, brzmią jakby były. On to the holiday. Here are a few readers’ black cats, but be sure to check out the Halloween Black Cat Parade from two years ago. Here’s my Lloyd, age 10, meeting his doppelgänger. When I was looking to adopt a cat 7 years ago I remembered hearing that black cats were statistically the least likely to be adopted from shelters. I don’t know if that’s true or not, but I do think that black cats are the most beautiful of all cats, so I deliberately set out to fall in love with a black cat. I think I interviewed half the black cats in Milwaukee, where I was going to grad school at the time, before I found my boy. This is my cat Electron. Originally from the swamps of the south Louisiana bayou she is now a denizen of the Pacific Northwest living in West Seattle. She is very talkative, but this is one of her contemplative moments. Pele was a great combination of a super loving staff owner, who loved to be held, and loved to be involved in everything I did, as you can see by his supervisory position on top of my aging PC, circa 2000. This is my black cat Moe (9 years old), practicing for Trick or Treaters. Here’s a pic of my daughter’s newly adopted black kitten, Winter, from Tampa, FL. She likes to sit on top of the stairs and look down on her staff like Ceiling Cat. Just been to the Night of a Thousand Lanterns at the Botanic Garden. Some things you don’t expect on pumpkins. So here are some with “acceptable” subjects. I know goats are not one of your normally favored species. but in this case you can make an exception! Finally, if you click on today’s Google Doodle (i.e., screenshot below), you’ll go to a YouTube video, “Jinx’s night out” with the description, ” Today’s Halloween Doodle checks in on Jinx, the lonely ghost, who embarks on a mission to find the perfect costume — and a place to belong.” Note a case of Asian cultural appropriation in costumes at 1:35: Google screwed up! But last year’s Doodle, “Magic Cat Academy”, an interactive game, was much better, and I don’t know how I missed it! You can play it by clicking on the screenshot below (draw a ghost’s symbol with your mouse to dispel the spook). There are several levels, and I got to 15,400 before my cat used up his nine lives. Finally, a tw**t sent by Matthew (for non-Brits, Matthew explains: “Celebrations are cheap small versions of confectionary bars. A Rennie is an indigestion tablet”). This entry was written by whyevolutionistrue and posted on October 31, 2017 at 6:30 am and filed under holidays. Bookmark the permalink. Follow any comments here with the RSS feed for this post. Both comments and trackbacks are currently closed. I swear I can see Cary Grant and Eva Marie Saint rappelling down a cliff-face away from James Mason and Martin Landau in that first pic. 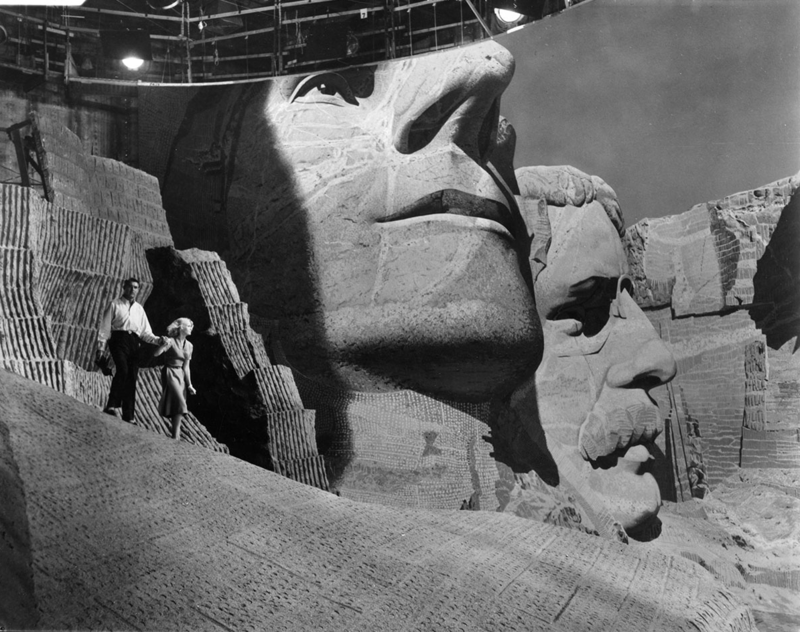 The reconstruction of Mount Rushmore is Hitchcock’s “North by Northwest” is actually 25% actual size though in a few places rear projection photography is used. Roosevelt’s head is much less far back on the set than on the real Mt. Rushmore. Someone once described North by Northwest as the story of what happens to Cary Grant’s blue suit over a few days. It’s a really nice suit. Nice to see Muzzy Izzet mentioned. A wonderful player and one of the late 90s Holy Trinity midfield (Izzet-Lennon-Savage). I still maintain that Turkey would have beaten Brazil in the 2002 World Cup semi-final if Muzzy Izzet had played from the start. Studs Terkel, born 1912, died 2008. The Google doodle is illogical – why can the ghost wear a hat & then pass through a tree? Why can it part bushes but have someone put a hand through it?! Lots of very lovely cats, including Hili. Halloween is only once a year but cats are everyday. Have been to Rushmore but it was long ago when I saw Teddy, Abe, Thomas and George. The drive included going through the Bad Lands on the way. For those not familiar South Dakota has great change in the geography from east to west. The great shame of flat screen monitors is that our cats can no longer sit on them while we work. And there’s another instance of cultural appropriation in the Google Doodle: the mummy. I remember quite a few people claiming mummies are cultural appropriation when the newest installment in the Mummy series hit theaters earlier this year. When Tutankhamun makes a complaint in person, I’ll listen. He will get his mummy to do so . Billy has solved the flat-screen monitor issue by sleeping behind the monitor. Every now and then, if he’s not sleeping, he’ll reach under the monitor and steal John’s pen, or his glasses, or his notes…. My wife runs a low cost spay neuter clinic Paaws (a 501 3c in Fargo) for cats. There are lots of folks who can’t afford the rates commercial vets charge. Finding people to adopt black cats is much more difficult. Sounds like a great place for people looking for what to do with their charity monies, as are all animal shelters. The goat has something to do with a curse on the Cubs. It was “broken” last year. I think. I think you may be right. The goat should not get to claim 108. Otherwise, maybe something to do with a radio station that plays music someone doesn’t like? The October 31, the so-called Reformation-Day, is usually celebrated in Germany in memory of the Reformation of the Church by Martin Luther as a holiday only in the predominantly Protestant states such as Saxony, Thuringia, Lower Saxony, Brandenburg, Mecklenburg. On this day Luther nailed or pinned 95 theses (against the indulgence, one can not buy himself with money from his sins) on the church door of Wittenberg. Because this event is celebrating its 500th anniversary today, it is today exceptionally a holiday in all federal states of Germany. When did he start eating Worms ? I know this makes me a raging liberal but… I think Mt Rushmore is an abomination. We wipe out most of the Lakota Sioux and then put our faces on mountains they consider holy. Seems like such a grave and enduring insult. I won’t ever visit it. Well, there’s always the Crazy Horse monument!Worth a visit. Is Crazy Horse finished? I have photos from 1973, 1982 and 1993. They are identical photos of a bulldozer between the hollowed out section for the horses legs. The only difference is the yellowing of the photograph. I can see where you’re coming from, but I look at it from the perspective of someone living in Britain – an ancient country with thousands of years of history, not just a couple of centuries. Our entire landscape is a palimpsest of features left by one culture succeeding, or in some cases replacing, its predecessors. Neolithic standing stones, Bronze Age barrows, Iron Age hillforts, Roman walls, Saxon churches, mediaeval castles, the list goes on and on, all the way down to the present day. Waves of immigrants and invaders leaving their mark. For most of us, the land, and our collective culture is richer for it. The Lakota had their time, they were just overcome by a stronger, more advanced and more populous civilization. That’s how it’s been throughout human history, and probably always will be. Personally, I think that big knobbly outcrop to the left of Washington is just crying out for the likeness of Donald Trump! As another Brit ,i dare you to post that on the daily hail on line site . Agreed with it by the way . Have you ever read “In Search Of The Dark Ages “by Michael Woods ? Yes, I read “in Search of the Dark Ages” way back sometime in the early 80s, not long after the TV series was on. I love Michael Wood’s books and documentaries, I think he’s a real scholar and a much underrated presenter. Re. The Lakota had their time… A large component of that is that they were no match to the diseases Europeans brought with them, that had evolved from diseases of domesticated animals that the natives didn’t have nor resistance thereto. Summarized, IIRC, in Metzler’s First Peoples in a New World. As my son, who is a registered member of the Citizen Potawatomi Nation, tells non native Americans who complain about Mt. Rushmore, Washington Redskins, Columbus day, etc, if you really want to do something, move out of your house and give their land back. I wonder how many “Home Owner’s Associations” (have I got that right?) have byelaws prohibiting that sort of thing? Or, in Scots law, I think it’d be a “feu upon the property” (same root as “feudal” ; IANAlawyer). Hili’s in good company today. Thanks readers for the nice black cats and commentary. After taking those photos, I poked Orson’s toebeans. He pulled his paw back under his chest and looked at me with contempt. Apropos the cartoon at the end, Halloween has only become a big thing in Britain in the past twenty years or so. Trick-or-treating has completely supplanted a much older late-October tradition called “Penny for the Guy”, which involved children making a Guy Fawkes figure from borrowed clothes stuffed with straw, putting the figure on a trolley, then begging for small change at street corners. Guy Fawkes, I need hardly remind you, was the ringleader of the Gunpowder Plot to assassinate King James, the failure of which is marked in Britain with fireworks and bonfires every November 5th. Yeah, I remember as a kid (~30 years ago) that Hallowe’en in the UK would be: “what’s that about, really?” – along with other incomprehensibles like American football and such. Well not really true ,i can remember 50 years or so ago,my late older brother chucking stones on to the roof to scare us ,only food involved was bobbing for Apples . only food involved was bobbing for Apples . Oh no – we’d make toffee apples (some years) but that was more for Guy Fawkes Night, not Hallowe’en. If we got a big crab off the neighbour’s tree, that’s get a coating of sugar too and put with the rest as the “something nasty in the woodshed”, which probably has a bit of Hallowe’en-ish in there too..
And 4th /6th /7th /of November . Only that? Lucky you! Where I lived in the UK it was usually a two-week period, starting on Nov 1st, in which every night I would seemingly be subjected to a barrage of anti-aircraft fire being loosed off all around my house. It lost its novelty after a while. Firstly, The mobile phone texting to the dead has happened in real life. The dead person’s number got recycled. Secondly, I’m definitely offended and resentful in Matthew Cobb’s tw**t. Trick or treating in the UK was an unnecessary cultural appropriation from the USA. I blame Charlie Brown. It seems more like licensed extortion to me – “you give us a treat or we trick you by damaging your property in some minor way”. Bah, humbug. To me it seems more logical that it should be me the home owner treating or tricking you the hopeful child, in much the same way as Charlie Brown, in the aforementioned cartoon, always getting a rock. Did I say “bah, humbug”? Huh, that’s interesting. It may be due merely to regional variations or just lost in the past, but I’m a USian that was never aware of that aspect of Halloween. My experiences over my entire life are that it was simply a fun time to dress up as whatever fantastical character you like and go out and score a bunch of free candy. Horror is definitely a major aspect of it, but it’s not exclusively about horror. But vandalism of any sort? I never as a kid or adult learned that about Halloween. I did come to learn about celebrating with vandalism when we lived in Germany though. Witches Night, or Walpurgisnacht. I was shocked, and rather scared, the night my German friends took me out vandalizing homes throughout our little German village. I certainly had never done anything like that in the US. Well, I suppose I did participate in TPing a home or two, and my high-school, in the US but there wasn’t an annual holiday devoted to it! and go out and score a bunch of free candy. And the occasional razor blade. Or toffee’d crab apple. The trick part of “trick or treat”. I was exaggerating slightly for effect. You might get kids throwing raw eggs at your front door or scrawling humorous messages on your car in lipstick or some other practical joke. I remember asking my parents in about grade 1 or so about the “trick” part. I was told I was not allowed to do it. I read somewhere that it was the Irish that took Halloween over to America . I just learned that from some Irish friends last night while visiting them for a drink. They claim it originated from Celtic tradition. I just discovered yesterday there are multiple brands of candy corn. Brach’s is allegedly made from real honey. However, I’m not especially curious to try. I’m not quite as apocalyptic about it as JAC (at least yesterday), but am still not a huge fan. It’s really interesting to realize what a huge role Halloween obviously plays for Americans. Of course, the churches are not thrilled that on Oct. 31 ,Reformation Day, now Halloween is getting all the attention but they have no chance, no one “celebrates” reformation, it’s just a nice holiday and the kids love Halloween. A great difference to America seems to me that even adults disguise and celebrate Halloween there. Doesn’t the profit (no spelling mistake ) pat robinson go on a rant at this time of year regarding how evil Halloween is? Unfortunately, I do not quite understand your contribution. I can only say that people like Pat Robertson, who think that natural disasters are to be considered a punishment of God, would be an impossibility in Germany, they would be a persona non grata in public. It’s a pun on prophet. I hate Halloween. All of it. The witches, once burnt in real life, now brought back as figures of fun; the mummies, once laid to rest with respect; the ghosts, who were once real people. It is some horrible American idea that has now taken over England. Wasn’t there some little thing about a monk nailing complaints on a church door five hunfred years ago today? Yes and in Germany we official celebrete this special anniversary as a national holiday. We all should. He didn’t intend it, but Luther set in motion the unfinished process of freeing human minds from superstition. Luther is a great example of someone setting something important and world-changing in motion that had almost the exact opposite effect intended. By promoting the idea that people should read the bible on their own and thereby improve their piety, he opened it up to more literary and historical criticism. I sometimes wonder if the cherem against Spinoza was for this more than for the pantheism. Don’t know if it’s a black cat, but here’s a great rescue story – video of a French sailor and his cat, Pipalup (love the name), in distress of the coast of Alaska, being saved by the Coast Guard http://www.yachtingworld.com/video/video-dramatic-rescue-of-french-sailor-and-his-cat-after-30ft-yacht-lost-its-rudder-and-rigging-400-miles-south-of-alaska-68551. A bit difficult to see, but both were saved. And to mix metaphors, I think this video of Al Roker, et al., having a candy corn pizza tasting https://www.today.com/food/candy-corn-pizza-giada-al-roker-curtis-stone-taste-test-t117857 takes the cake. Sounds like one of the most vile concoctions imagined — but that’s prefaced by comments on a previous pizza tasting Peeps pizza, which may be even worse. I give it to my sister. When I go out to trick or treat. I would even eat my own feet. Kinda an ordinary and regular one. But they have their o r a n g e on !